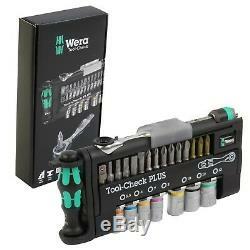 Wera Tool Check Mini Ratchet Screwdriver Socket Wrench Bit 1/4 Metric 39 Pc. 1/4" Mini ratchet, Kraftform holder, tough viscous bits, Rapidator holder adaptor and 1/4" sockets. Ideal for working in confined spaces. Tough viscous bits for universal use. 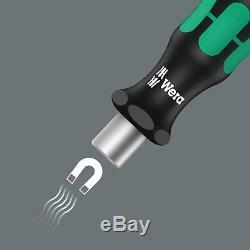 Use of 1/4 sockets also possible with the Wera adaptor 870/1. "Take it easy" Tool Finder with colour coding according to size. 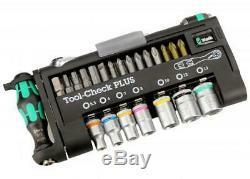 Combination tool consisting of a ratchet, bits, sockets and holder in a minimum of space. Ideal as a universal companion for a whole host of screwdriving applications. High quality bit holder with Kraftform Plus handle for pleasant, ergonomic working that prevents blisters and calluses. Hard gripping zones for high working speeds whereas soft zones ensure high torque transfer. 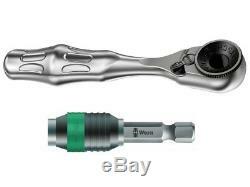 Mini ratchet for rapid working when fastening jobs with a power tool or conventional hand tools are not feasible due to insufficient space. Rapid changeover from left to right direction and vice versa by using the switchover lever. Fast work possible by turning the thumbwheel (with the thumb) on the ratchet head. Simplest operation even with just one hand. Ergonomic ratchet head/lever: Kraftform geometry with perfectly shaped contact areas for the fingers. The direct bit take-up in the ratchet head makes for a mini tool design and is ideal for low working heights. The small return angle of 6° allows for precise work. Robust drop-forged, full steel design. Torque of over 65 Nm. The Rapidaptor bit holder with free-turning sleeve: can be used as an extension; for rapid bit change without any special tools even the very smallest bits with just a single hand. Tough viscous bits for universal use. 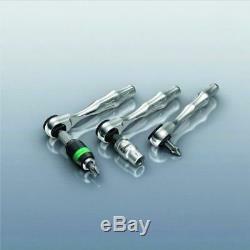 Sockets for both manual as well as power tool operations for almost all applications. "Take it easy" Tool Finder with colour coding according to size - for simple and rapid accessing of the required tool. Featuring a good grip to allow easy pick-up even with oily hands. Ball stop groove, for hex head bolts and nuts; chrome vanadium steel, matt chrome-plated. 1 x 8001 A Bit Ratchet (87mm). 1 x 813 Bitholding Screwdriver Handle (78mm). 1 x 1/4in 889/4/1 K Rapidaptor Universal Bit Holder. 1 x 1/4in 870/1 Adaptor (25mm). 7 x 1/4in 8790 HMA Zyklop Sockets: 5.5, 6, 7, 8, 10, 12, 13mm. 6 x 25mm TZ Phillips Bits: PH1x2, PH2x3, PH3. 5 x 25mm TZ Pozidriv Bits: PZ1, PZ2x3, PZ3. 6 x 25mm TZ Torx Bits: TX10, TX15, TX20, TX25, TX30, TX40. 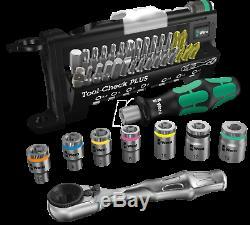 5 x 25mm Z Tamperproof Torx Bits: TX10, TX15, TX20, TX25, TX30. 5 x 25mm Z Hex-Plus Bits: 3, 4, 5, 6, 8mm. 1 x 25mm TZ Slotted Bit: 1.0x5.5mm. We will do our best to provide a solution. We stand behind every product we sell. Feedback is extremely important to us! 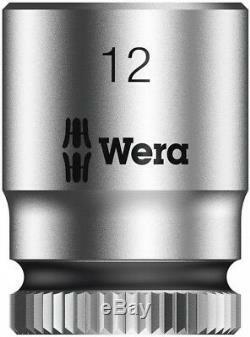 The item "Wera Tool Check Mini Ratchet Screwdriver Socket Wrench Bit 1/4 Metric Set 39 Pc" is in sale since Sunday, April 23, 2017. 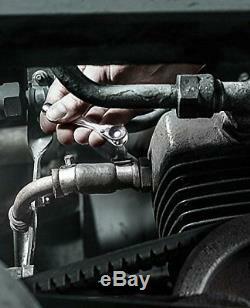 This item is in the category "Home & Garden\Tools & Workshop Equipment\Hand Tools\Screwdrivers & Nutdrivers". The seller is "shirlevinsk-0" and is located in Petach Tikva. This item can be shipped worldwide.